A lot of the contents that we can find over Internet isn't in our own language, making it necessary to resort to a translation application to be able to understand the information that we have found. 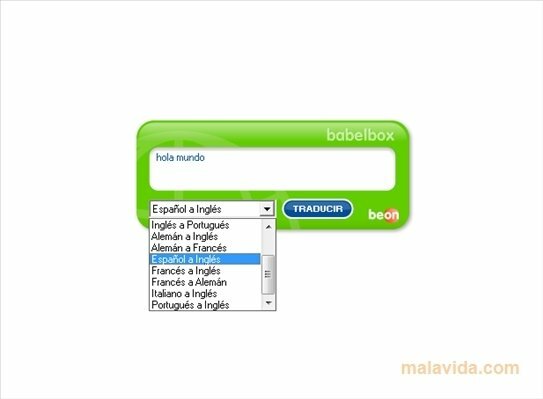 Babelbox is a practical widget for the desktop that makes is easier to be able to translate between two languages, because it only requires that the user pastes a text or URL, select the original language and wait for the application to provide a result. It has very appealing interface, mainly due to its lively colors and the rounded edges. The application is capable of translation from English to Spanish, German, French, Portuguese and Italian, from German to English and French, from French to English and German, and from Spanish, Portuguese and Italian to English. Therefore, if you want the translation of any text to be as simple and quick as possible download and install Babelbox as soon as possible.